A year ago we were shocked and horrified as the news broke about a man named Dylann Roof who walked into a place of fellowship and prayer. Despite the hospitality he received there, he opened fire, taking the lives of nine people. Mother Emanuel AME in Charleston, S.C., became a symbol for what happens when hate and violence take control of someone. Days later, defying imagination, the families of the victims gathered in the courtroom to confront the man who had killed their loved ones. They took aim and fired with the most powerful weapons they had at their disposal. “I forgive you,” Nadine Collier said to Dylann Roof. Nadine is the daughter of Ethel Lance — who had been shot by the very same man she was now addressing. In that moment, hate and violence were robbed of the last word. In that moment, Mother Emanuel became a symbol for what happens when love and grace take control. I had already been thinking about that anniversary when I turned on my computer this past Sunday morning and saw the news from Orlando. A different man in a different place but possessed of the same spirits of hatred and violence walked into a building and opened fire. He took the lives of 49 people — the worst mass shooting in American history. In the days since, many have responded. Almost everyone blames the shooter, calling him angry and unbalanced. Some people blame the religious group of which he was a part. A handful of people have blamed the victims for their choices in being in such a club in the first place or for not fighting back in the moment. I’d like to suggest a different response, however. The most amazing thing about what happened a year ago in Charleston was that the people who had actually might have had a reason to hate and demand violence overwhelmingly refrained from doing so. Rose Simmons, the daughter of Rev. Daniel Simmons, Sr. rejected the idea that her father’s killer might be beyond redemption. She refused to ask for the death penalty for Roof and won’t even speak harshly when his name comes up. Instead, Rose and others engaged Dylann Roof to the extent that he would listen to their offers of forgiveness. Instead of standing against him, they stood for him, offering him grace and hope for the future. I hope and pray that the example set by the people of Mother Emanuel has something to offer us in the midst of this latest tragedy. It’s a bit easier I suppose for us to reject the overt racism of the white on black violence that occurred in Charleston. Whereas in Orlando, the situation is seemingly more complicated by the fact that a Muslim attacked what was a popular gathering point for the LGBTQ community. But I wonder if it really is any more complicated? The simple question we have to ask ourselves is this — does a person’s beliefs or actions determine whether or not we are willing to offer them love and grace or not? Offering love and grace might be hard, but the question isn’t…not if we are going to proclaim Jesus as Savior and Lord. I know that there are a variety of opinions on issues such as human sexuality, terrorism, war, etc. in our Fellowship, but surely we can all agree on this one thing — we are called to follow the one who rather than standing against those who despised, betrayed, and rejected him, instead chose willingly to stand with us and for us, even to the point that it cost him his life. It means we stand with and for the members of the LGBTQ community. They should not doubt, not for a second that we love them, and that our hearts are breaking for them that they were targeted then (and not just then) for violence. Taking up our cross demands nothing less. It means we stand with and for the Muslims in our nation who are fearful of what this means for them in terms of slurs and attacks. This isn’t a naïve belief that no one in the Islamic community wishes to do harm. It’s a demanding act of faith. Jesus didn’t ask us to turn the other cheek to people who weren’t angry. He didn’t ask us to extend grace to those who didn’t require it. The cross is the supreme example of a willingness to love regardless, without condition. I am grieving today still. I think we all should be. Hate and violence have spoken again. But I am also hopeful because I have seen what can happen when love and grace get the last word. 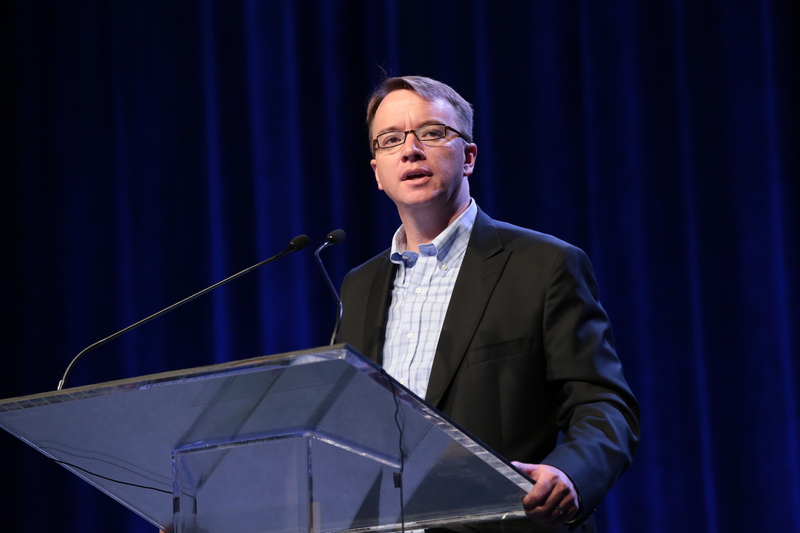 Dr. Matt Cook serves as the CBF Moderator for 2015-2016 and is pastor of First Baptist Church in Wilmington, N.C.